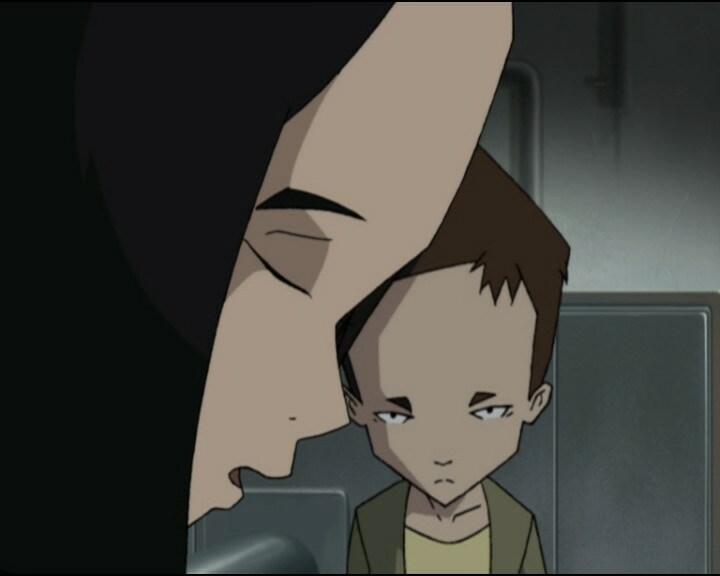 Ulrich, Odd, Yumi and Aelita are on Lyoko in the middle of trying out their new vehicles that Jeremy made. Odd and Ulrich race despite Jeremy’s warnings. Odd uses a rock as a ramp and crashes into another rock higher up. 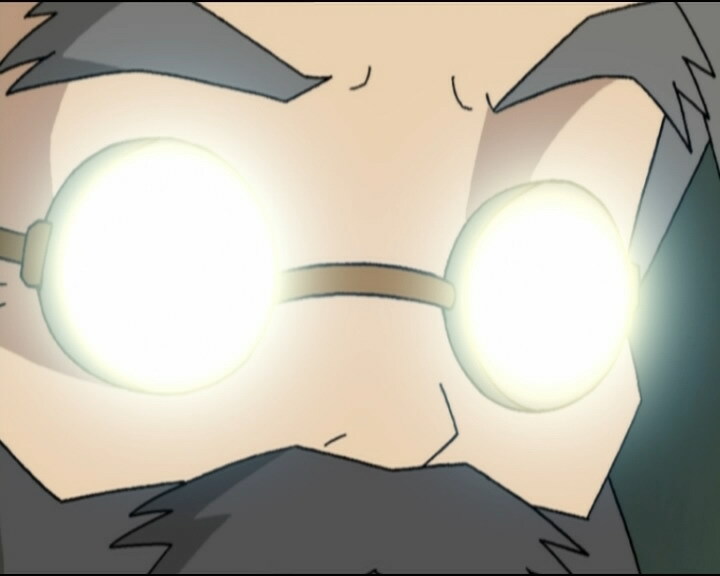 As Ulrich teases him about it, a new unknown monster is spotted by Jeremy’s computer, but even it can’t identify it. All they know about it is that it has more life points than the others (around 125LP), that it’s very hard to fight and that its XANA eye target is rather small on its face… All the heroes are devirtualised in a short time. 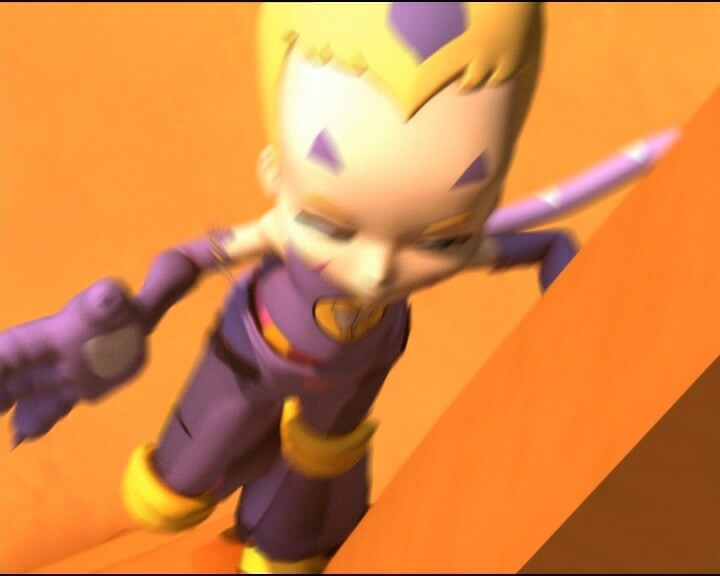 While they try to fight it, Aelita is sent back to Earth using Code Earth in a tower. When everyone has returned, Jeremy explains that XANA has created this monster recently, so it must have become more powerful. So now they need to expect anything and everything. Jeremy tells them that he’s also developed a new Scan program that’s a lot more efficient than the old one which will allow them to detect activated towers instantly. 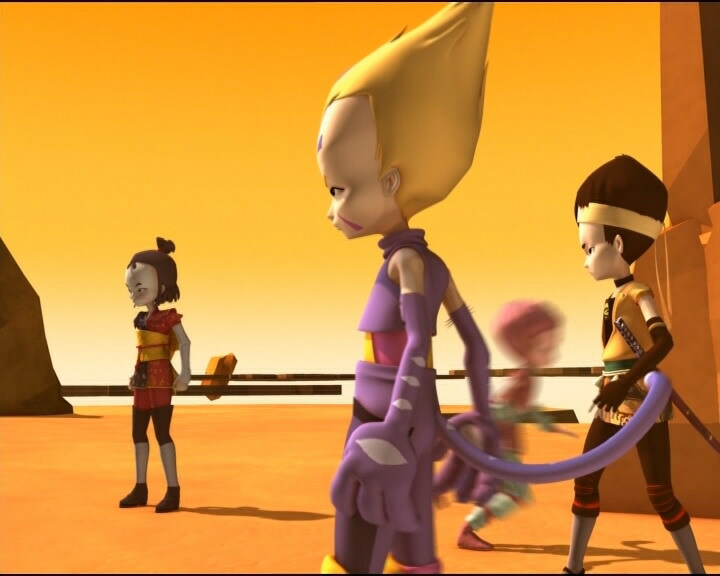 The team then announces to Aelita that she’s no longer needed to stay on Lyoko. Aelita discovers her new room at the school and the meal times. Following that, they leave for the forest to take photos and sketches of trees and flowers for science class. They need to pair up so Jeremy goes with her, Ulrich with Odd and Yumi with a new student: William. Ulrich thinks that William has stolen the spotlight and that there’s something between him and Yumi. Meanwhile, Jeremy realises that he’s left his laptop at the school and tells Aelita he’s going to go get it and that she should wait where she is. But Aelita has a vision and believes she can see a giant wolf. She becomes scared and runs. That’s when she happens upon an abandoned house. 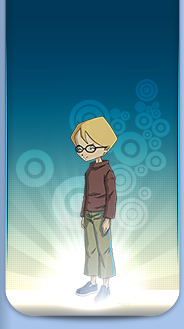 Meanwhile, Jeremy arrives at the school and when she grabs his laptop he realises that XANA has activated a tower. He leaves for the factory and asks his friends via telephone to join him. 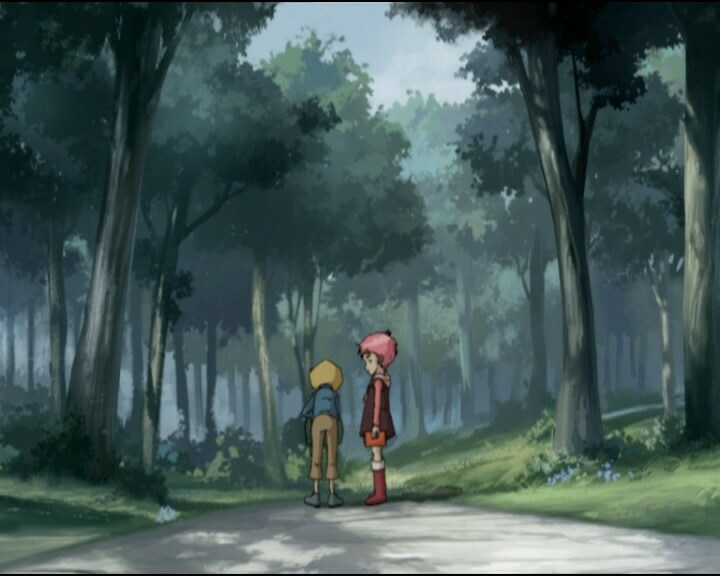 But first, they need to pick Aelita up from the forest. The three friends meet in the forest where they search desperately for Aelita. The young girl has entered the house and is having visions of a man who lived there in a white lab coat playing piano. Jeremy is downright distraught when Odd tells him they can’t find her. But Odd assures him by saying that Kiwi has followed a scent to the abandoned house and that they’re going to go take a look. Unfortunately XANA has taken control of the building and locks the doors so they can’t escape. It also throws all kinds of objects at them. They find Aelita lying on the ground in the basement. She tells them it’s a trap, but it’s too late. The door closes. Only Odd manages to escape with Aelita; Yumi and Ulrich are stuck inside as XANA begins to heat up the room at a monstrous rate. Aelita has another vision and finds a passage to the sewers. They meet Jeremy at the factory and are virtualised. They fight against two Tarantulas (the new monsters, as named by Odd) and manage to defeat them after setting a trap using the vehicles. Meanwhile, Ulrich and Yumi have taken their shirts off to cool down and they talk about William. Yumi says that he’s just a friend before falling unconscious. The tower is deactivated and the Return to the Past is launched. Odd separates Ulrich from Yumi and William so they can actually get some work done. Aelita reveals everything to the group about how she knows the house as if she’d already been there. Jeremy gives her a pink phone so they can stay in contact. - Attack: Take control of the Hermitage and use anything in it possible to eliminate the heroes. - Return to the past to save Ulrich and Yumi from the overheated boiler in the Hermitage. 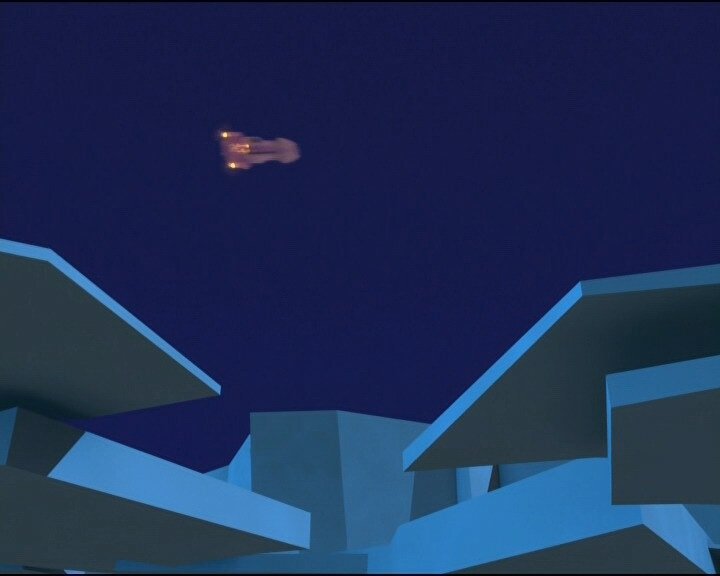 - Jeremy has developed a Superscan to find towers instantaneously, which allows Aelita to live on Earth. - Jeremy’s new quest is to find an antivirus for Aelita. - First appearance of the vehicles. - First appearance of Aelita’s new outfit. - First appearance of William, who we know falls for Yumi at first sight. 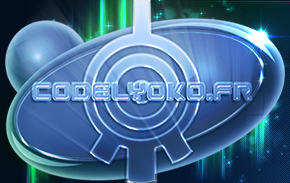 - Change of Lyoko’s design, especially with regards to the Forest. - First mention of Jeremy, Ulrich and Odd’s family names. - William was expelled from his last school! - Characters in the series seem to be interested in a band called the Subsonics; first mention of them. - Aelita pretends to be Odd’s Canadian cousin: Aelita Stones! She boards at Kadic and Jeremy gives her a pink phone. - The factory microphone changes nonstop (wired or wireless). - The lift doors are open when Jeremy tells Odd not to take risks on the Overboard, when that shouldn’t be the case. - When Herb asks Sissi where she’s going as she walks to the shopping centre, Sissi’s eyebrows are the same colour as her headband. - When Aelita notices the Hermitage in the forest, the attic window disappears. - When Yumi receives a call from Jeremy, it’s not her phone but Ulrich’s. - The back door of the Hermitage changes just before the armoire destroys it. - Jeremy’s bag disappears from his back when Aelita questions her visions at the Hermitage. - Just at the moment when Herb looks at the mark Ms Hertz gave to Sissi, the collar of his shirt is green. - The tower Aelita uses to get back to Earth doesn’t have a halo after the Tarantula devirtualises Odd. - Aelita’s Overwing is still visible on the computer screen after it’s been destroyed by the Tarantula Odd then exterminates. - Odd’s outfit is reversed when his Overboard is destroyed by the Tarantula, notably making his hair spiked to the wrong side. - When Aelita’s with Odd and Kiwi and she’s looking at the passage to the sewers, a flashback appears. We see her in it with Franz and she’s wearing her regular clothes, but in that time when she left with her father, she didn’t have those clothes. She wears the same clothes as in episode 25, “Code Earth” and 26 “False Start”. 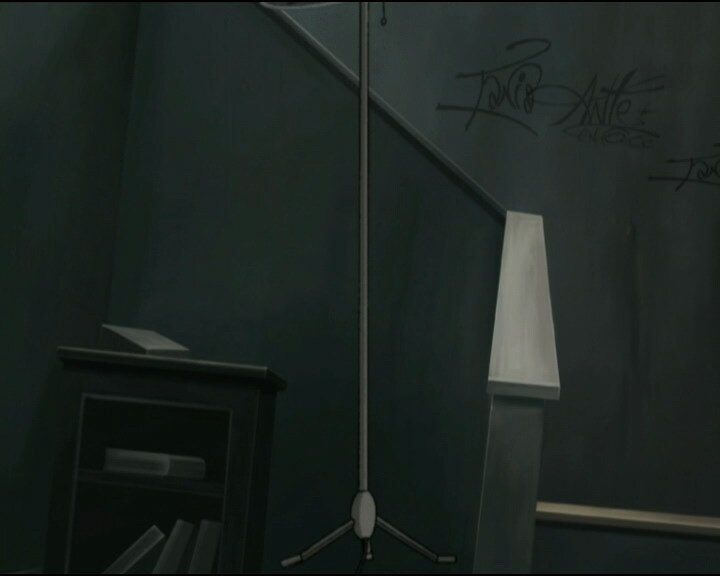 This is confirmed in flashbacks of the same scene with Franz in episodes 52, “The Key” and 57 “Aelita”. - New opening theme, ending theme and background music. - First appearance of Aelita’s old house called the Hermitage! We also see the secret passage from it to the sewers. - First episode in which we see monsters communicate with one another. - Jeremy can now reload Odd’s arrows up to 10 000. - Regarding the school hours at Kadic: breakfast and dinner are served at 7 in the morning and afternoon. Access to bedrooms is prohibited between 8 and 4:30. - First mention of the Subsonics. - During a conversation, a comparison is made between the fake name “Stones” belonging to Aelita and a famous rock group…it’s a famous group made up of 8 members: The Rolling Stones. Dim sum is a style of bite-sized Chinese food often served on small plates or small steamer baskets. Tea is typically served with it. Most traditional dim sum foods are steam cooked. Odd: You really did a great job, Jeremy! XANA better behave himself now that we’ve got these things! Odd: Don’t worry Einstein, I know how to ride! No way I’m gonna let Ulrich beat me! Ulrich: Oh no you don’t! Jeremy: Maybe it’s the rider who needs the work! Ulrich: I guess surfing’s not my thing. Aelita: I’ve never seen a monster like that one before. XANA must have just created it! Odd: This thing is really unbeatable! Odd: Otherwise we don’t stand a chance against those Tarantulas! Odd: Tarantulas, the new monsters! I like to give my enemies a name! Jeremy: From now on, we have to be ready for anything and everything! Jeremy: Uh…should we tell her? Yumi: Well of course we should tell her, why keep good news like that a secret? Ulrich: Here, with us. We’ve already enrolled you as a boarder at the school! Yumi: Everything’s all set up. We wanted t surprise you! Aelita: Stones. Aelita Stones, like the rock group. I’m Odd’s cousin from Canada! Jim: Oh! So, Aelita, breakfast starts at 7am, and dinner’s at 7pm. It’s against the rules to be in your room between 8am and 4:30pm. You can ask your friends Della Robbia, Stern and Belpois to fill you in on the rest of the rules, that is if they can remember them! 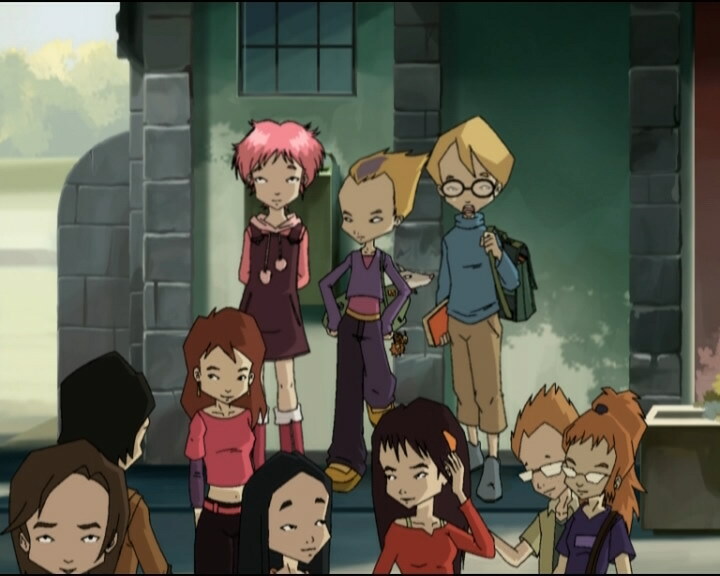 Aelita: Hey, what’s this field trip everybody’s talking about? Jeremy: We’re going to make a biodiversity scrapbook. Ms Hertz wants us to take pictures and to draw plants and flowers. William: Yo, Yumi! Ms Hertz said ok, we can work together on the field trip! Yumi: Hey! W-William, do you know Ulrich? William (cold): Huh. Oh, you’re Ulrich Stern. Yumi mentioned you. Ready to go? Yumi: Coming! (to Ulrich) Didn’t you have something to tell me? Ulrich: I’ll tell you later. Jeremy: Did you know that trees grow new branches from one year to the next according to an exponential ratio of 1.6? 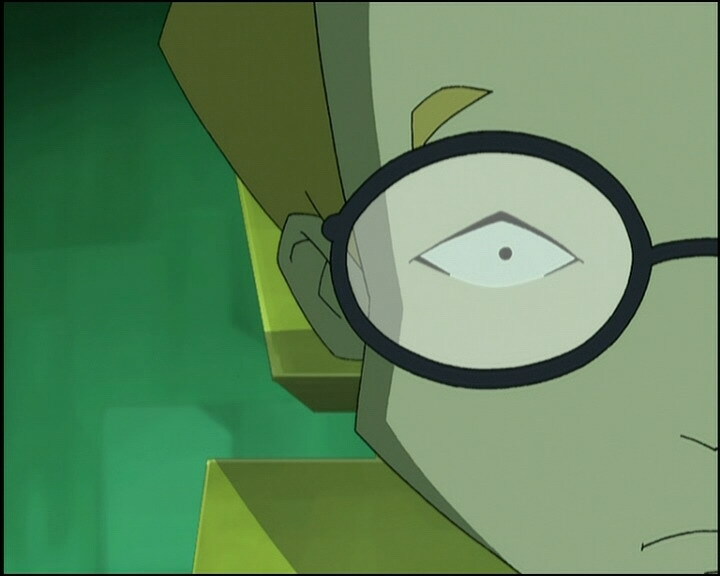 Aelita: 1.618 to be exact; it’s the golden ratio. Say, do you think nature obeys non-linear equation systems? Herb: Hey, Sissi? Where are you going? The woods are this way! Sissi: Yes, but the stores are that way! Sissi: There’s a florist in the shopping centre. Jeremy: Nah, there aren’t any monsters in these woods! That only happens in fairytales or in silly horror pictures, heh, the kind that Odd likes! Odd (to Ulrich who’s watching Yumi and William with his camera: Oh stop freaking out, you know Yumi’s crazy about you! Odd: I can’t figure you guys out. Are you going out together or not? Ulrich: Erm…not really…it’s complicated…right now I’ll bet he’s completely snowing her! Yumi: You mean love makes you crazy? William: Makes me totally insane. Aelita: Monsters only exist in fairytales…monsters only exist in fairytales…! Jeremy: Just what I was afraid of! XANA’s attacking! William: But hey, being sensible is just not sensible! Yumi: Hey…nervous aren’t we? What a warm welcome…nice! Odd: Yumi, we can’t find Aelita! Jeremy: Don’t tell me you haven’t found her yet! What have you guys been doing?! She may be in big danger! Odd: Chill Jeremy, ok? We’re doing everything we can! Who knows, maybe Aelita just went back to school? Kiwi led us to an old house in the woods. We’re gonna take a look inside. We’ll call you back if we have any news. Ulrich: Are you thinking what I’m thinking? Odd: Yeah, and that means Aelita must be here somewhere! Yumi, Odd and Ulrich: Aelita! Odd (holding the door open): Get Aelita out! Odd (seeing the heat gauge rising): You’ll be cooked alive if we don’t get you out of there! 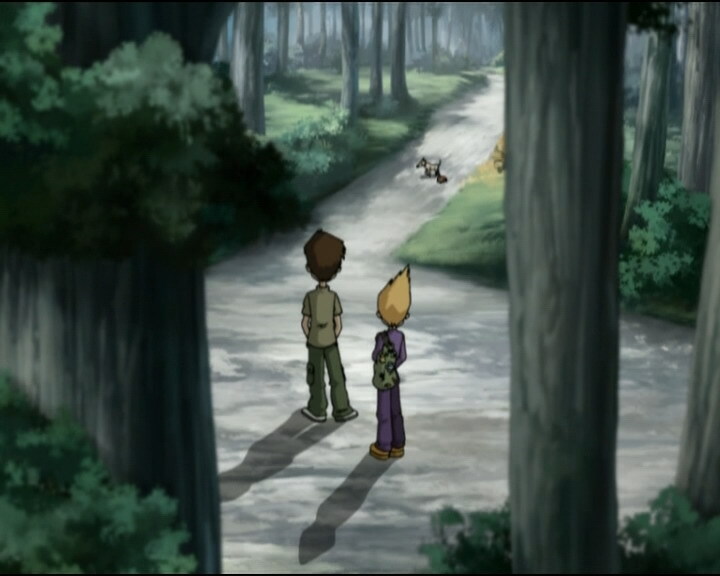 Aelita: Odd, there’s a passage over there, I…I think it leads to the sewers! Odd: This is no time for jokes, Aelita! Yumi: Forget it, Ulrich. I should’ve told you about William sooner. Jeremy: Aelita! I was really worried! Odd: No time to lose, Einstein. Otherwise Ulrich and Yumi will end up like dim sum! Jeremy: Aelita, the Overwing is for you! Odd: Our taxis are waiting for us, let’s go. Odd: I’ll never be able to fight my way through two of those horrors! Aelita: Maybe I can lure away one of them? Jeremy: Aelita, what are you planning on doing? Odd: She’s gonna steal the show! Odd: Yoohoo, surprise! (He fires and the Tarantula explodes) They’re not all that invincible! Ulrich: Yu…Yumi…I um uh…what’s um really going on…(pant)…between you and uh…William? Ms Hertz: Hm…congratulations, Ms Delmas. You found an Amazonian Yucca here in our woods? Sissi: Uh, yeah! And it wasn’t easy either! Jeremy: So did you manage to get any drawing done this time? Odd: Yeah, but I had to drag Ulrich far away from Yumi and William. Going back in time didn’t change anything there. Jeremy: I went to check out that house, the Hermitage. Nothing to report. It’s gone back to being a normal house. Abandoned, but normal. Odd: Not to mention the underground passage that you knew about. 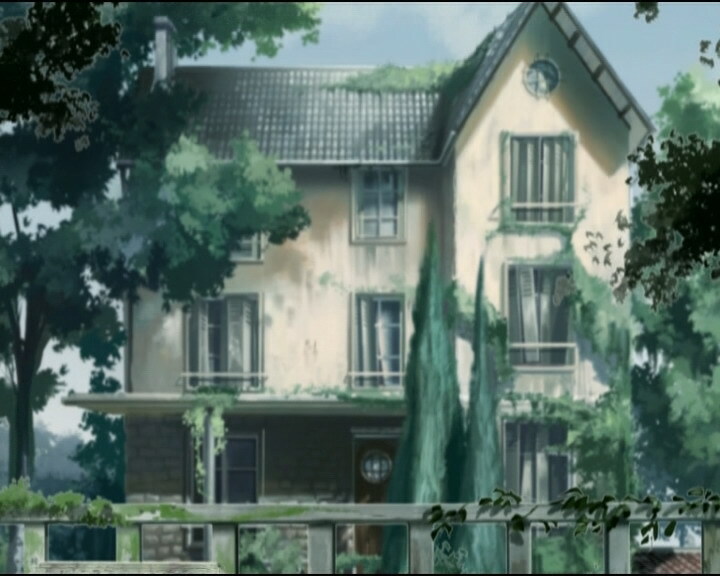 Aelita: It’s as if I’d already seen that house…in a dream. Yumi: A new mystery to solve for us! Jeremy: By the way, uh, Aelita? This is for you. It’s to keep us one step ahead of XANA! Jeremy: This way we can always stay in touch! Hahaha! Uh, I thought that pink would suit you. Odd: Wow, it looks cool. It matches your hair! Aelita (hugging): Hahaha! Thank you, Jeremy! Odd: There you go, you’re like a regular school kid now!